A good working ethos has to form the basis of any strategy and a behavioural approach to health and safety is truly beneficial for all parties. This begins at board level where it is an overriding focus, helping to ensure health and safety becomes a natural part of daily business life – and not an obligatory response to legislation. Working on some of the most complex construction projects in the UK, Prater strives to achieve a level of Unconscious Competence where people act safely as a matter of course – without having to actually think about it. Systems and processes are only ever as effective as the people implementing them. Prater ensures in-house H&S managers are visiting projects to undertake inspections and compliance audits at regular intervals. Regular inspections promote ongoing communication and ensure policies evolve. This means that when it comes to industry inspections, everything is in place for auditors reviewing compliance with standards such as BS OHSAS 18001, TUV, CHAS and Achilles. In addition, a key consideration has to be our multinational workforce, as this has had a direct impact on how we approach training people around health and safety. Effective communication is key to keep everyone safe and it is essential to adapt work methods and training to ensure it is suitable for all teams members. For example, it is worthwhile ensuring training programmes ask more questions of individuals to clearly ascertain the level of understanding from the outset. One of the many benefits of having an established supply chain is having a group of companies who have worked together effectively to deliver countless projects. This helps to foster confidence and a willingness to try new methods. A great example is the work completed on Glasshouse Gardens, which forms part of The International Quarter (TIQ) London. This project involved the construction of two residential towers with Prater installing the envelope cladding, glazing and roofing. 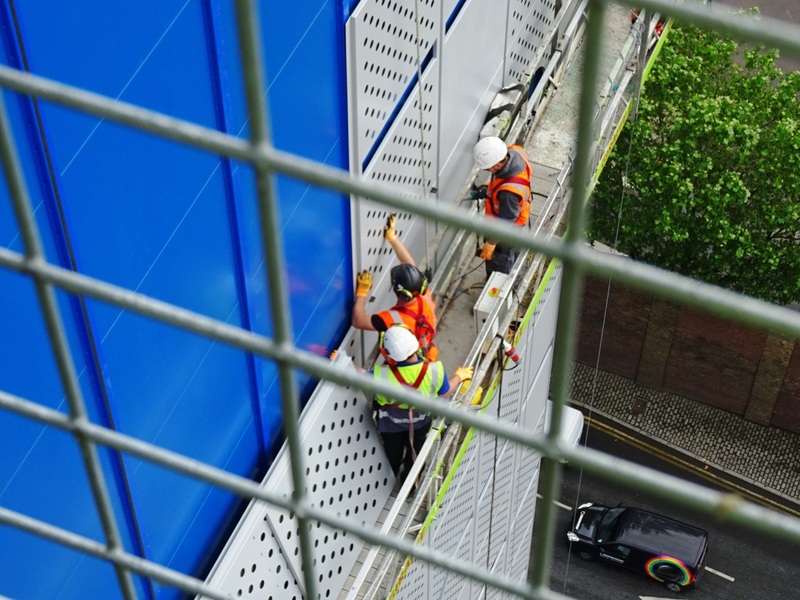 By working collaboratively with Lend Lease and the frame contractor, we adopted a new access methodology, replacing the need for fixed scaffolding by utilising a unique climbing screen from which the installation was carried out. 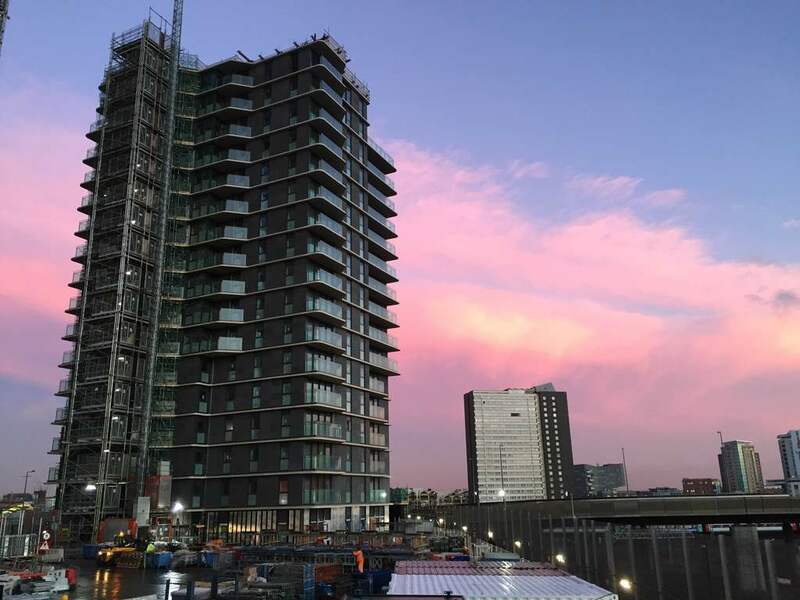 This enabled teams to safely install the façade on the two towers up to 31 stories with improved accessibility, and crucially, whilst keeping to the project timescales. Using the screen working approach, the team had excellent access to the outside of the building whilst maintaining a safe environment in which to work. This alternative construction method demonstrates greater flexibility. 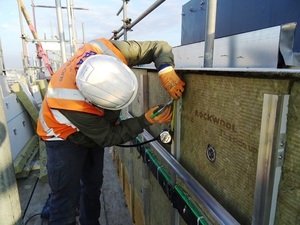 When working from standard scaffolding, it is static and fixed to the ground. At TIQ the screens were moving so it was vital to ensure everyone was aware of that, and ensure activity was controlled properly. This approach enabled the teams to complete a floor across both buildings every twenty four days whilst working across three floors concurrently. The screens on both buildings were moved every 8 days as a minimum as works were completed. It can come as no great surprise of the positive impact these elements are having on health and safety. BIM enables early identification of potential issues, giving supply chains time to address them, and for specialist contractors, it offers a clear view of delivery requirements to allow for more accurate planning to improve safety on site. Off site manufacturing also offers a number of benefits – not least of all reducing risk on site. When work is taken away into a controlled environment and work at height reduced, this can significantly improve overall health and safety for a project. Taking a behavioural approach to health and safety, embracing new ways of working and ensuring that BIM, digital engineering and offsite capabilities are effectively utilised – is the right combination of factors to help to safeguard people on site.